The San Jose/Evergreen Piano & Harp Music Center can provide a unique and beautiful musical program for your wedding. We serve the entire San Francisco Bay Area, and we can provide talented musicians for a broad range of instruments. We are also happy to assist you in planning the music for your wedding. 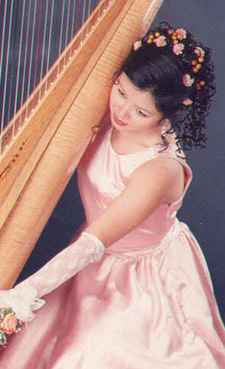 Our Music Director, Ms. Mary Angelina Mei, is considered one of the world's leading young harpists and pianists. Ms. Mei is an extraordinary performer and an excellent lecturer. A critic from the World Journal News calls her "a master of the heavenly angel instrument." Read more about Ms. Mei. We now invite you to listen to one of our demos, then check our fee schedule, or contact us to learn more. We look forward to providing the musical accompaniment to your special day.